Wow, I can’t believe that it’s been 20 years since I jumped into the world of pet training. I’ve been lucky to enjoy the last 15 of those years as a self-employed pet trainer/behaviorist. I’ve met countless amazing dogs, cats & people along the way. The true blessing is that they’ve all (humans & animals, alike) been my teachers & inspirations. But, it’s time for a change. I’m taking a break from training to follow my heart in a different direction: writing for my new site, The Soulful Pet. The Soulful Pet is a creative outlet where I can explore & celebrate the bonds we share with our pets. Pet guardians know that a life well-lived with animals is a unique one. Pets are family members. We learn from them, share with them, care for them, & cry for them. Of course, we hope that their lives are enriched thru these bonds, as well. As a writer, trainer/behaviorist, & pet guardian/advocate, I am excited about the endless possibilities of The Soulful Pet. I hope you’ll join me to create a community where we can share what we love about life with animals, on both the site & the FB page. I’ll cover all aspects of this sweet lifestyle: Foodie topics (recalls, recipes, healthy ingredients); product recommendations; social issues & commentary; pup culture; recommended reading (blogs & books); insights & inspirations; entertainment; and much more. I also hope to spotlight special people who do great work with animals, as well as animals in need. I’ll invite guest bloggers to tell their stories about how their lives have been touched by animals. I did consider that there are countless blogs about people & pets. But that’s a good thing. The more, the merrier, I say. It’s a group swim, and I’m jumping in to add my voice to the convo. What’s changed? I won’t be writing about the step-by-steps & how-tos anymore. They’re important, but talented others, whose works I’ll highlight, quite ably handle those. Instead, I’ll focus on helping folks understand their pets better by relating to them on a more equal level: We all share the same world & similar experiences. If it affects you, it affects your pet – and vice versa. If you see your pet thru your own experiences, you’re more empathetic. (I’m keenly aware that we are different species. Pets are not people, and I honor & cherish those differences.) Empathy creates understanding, compassion & patience. In turn, an enlightened human is a better teacher, companion & guardian for a pet. If an enlightened human pays very close attention, she’ll learn about herself thru her pets. It flows both ways, folks. What else makes my voice worth adding to the convo? In the last year, I’ve learned that I need to listen to my heart more. In doing that, I realized that I was ready for something new. My journey will inform my writing. In a way, The Soulful Pet is an integration of my spirit & my work that I’m sharing with you. It will be different: personal, honest & opinionated, non-PC, quirky-funny, philosophical, possibly political, random & heartfelt. Dare I say, “smartly soulful”? The Soulful Pet is an opportunity for all of us to thank & celebrate the animals in our lives. Let’s collectively spread the word that understanding, compassion and a positive training approach enrich & save lives. Along the way, we’ll laugh, cry & learn together, from each other. I’m hoping for many moments where we find ourselves saying, “Huh, I never thought about it that way before.” Or, “I can’t wait to try that!” Hmmm…… Does that make me your critter-life coach? Or you mine? Or are our pets ultimately our best life guides? So much to explore! PS – My little muse, Rusty, will be hanging out with me on The Soulful Pet. He’s relieved of his duties @ Rusty’s Dog Blog for now. I’m thrilled to have him as my teacher & friend. Join us there, won’t you? Woofs & hugs from us to you! Hey, we know you’re busy. Whether it’s summer activities, back-to-school prep, or hectic holidays —– life happens. You put pet training on the back burner because it’s just one more thing on your overflowing, overwhelming to-do list. You’ll get to it later. Besides, how on Earth could you possibly divide up your attention & time any further? Pick 3 training goals. Write them down & go public: Post your list in a prominent place. (Isn’t that what your frig is for?) Be realistic & specific about your goals. Tell housemates about the list. If they want to help, involve them in the list-making process, and/or share the items so that each person has only 1 or 2 goals to reach. Studies show that you’re more likely to achieve goals if you put them in writing, tell others about them, and make it a group effort. It works for keeping resolutions like weight loss, so why not dog training? Notice & reward the good stuff. The happy truth is that Pup offers desired behaviors more than unwanted ones. Human nature drives us to focus on the unpleasant. Ironically, responding to “misbehavior” usually reinforces it. Frustrating, right? So switch gears & try a new approach. Put some of your dog’s daily kibble allotment in your pocket @ the start of each day. (Really, just do it.) Consider your list & what you’d like to see more of in the future: not jumping, quiet rather than barking, focus on you, calmly relaxing on a bed, etc. You get the idea. The instant Pup does any of these on her own, praise & treat! (Or click & treat if you’re clicker training. Got another 10 minutes? Watch this tutorial.) Pup will eagerly repeat whatever made you happily produce pocket-goodies. Trust us: If you have kibble in your pocket (or a pouch), you’re more likely to notice when Pup’s an angel, your reward timing will be amazing, & Pup will learn faster. Think of yourself as a canine slot machine. She’ll play your game in hopes of your payoff! Set Pup up to succeed. Prevention & exercise are key to success. Prevent when you can’t train so you make more progress when you can train. Baby gates; crates; supervised, indoor-only leash dragging; chewies & food-dispensing toys as distractions – all help immensely. Prevent today’s unwanted behaviors so they don’t become tomorrow’s hard-to-break bad habits. Think puppy-proofing. Out of sight, out of mind. Exercise Pup routinely & adequately. Dog-to-dog play is a great mind & body energy outlet, for example. A happily-tired pooch is truly a better-behaved pooch. You’ll breathe a sigh of relief knowing that Pup’s more likely to contentedly rest @ home than to challenge boundaries. Voila! Human stress-buster & time-saver! Slip training into your routine. It’s simple: Ask Pup to do a command or trick before she gets things she wants. So if a great recall (“come”) is on your list, for example, call Pup to you for fun things like leash-ons, doors opened, meals, games, etc. You were going to do these things anyway, so take an extra second to train. Pup will love it. She’ll be highly motivated & focused because she’s working to get things she really wants. Instant canine connection & confidence booster! Mix it up to keep it fun. Variety truly is the spice of life for people & pets. Vary your commands to keep Pup guessing. That ups your “watchability” factor. Vary training locations so Pup listens to you wherever you are. Vary the people who work with Pup so she listens to whoever she’s with. (Why not trade training items from your frig list every week?) Training fails when boredom set in. Try incorporating game play into your routine: Why not have Pup “sit-stay” before you release her to “find” her meal, or maybe her leash before a walk? Are you gardening today? Take a break & call Pup to “come” as you run away from her. Or call her to “come” back & forth between family members while you soak up the sun. Play these games on your away-from-home outings, too – @ a park or a friend’s house. We love Pat Miller’s book, “Play with Your Dog” for more boredom-busting game ideas. Bonus: It’s a great summer read, loaded with ideas for rainy-day play! So our time’s up, and we know you have to go. Consider our tips. If all goes well, and you find training time you didn’t think you had in your day – fabulous! It’s more doable than you thought. Maybe add a few new items to that list on your frig. By year’s end, you’ll reflect on your terrific progress. Best of all: You & Pup will be better friends. We wish you & your pets a playful, wonderful rest-of-the-summer! “Resolution rescue!” – More tips on reaching your pet-related goals. “A Kong redemption” – Renew your dog’s interest in one of the most versatile toys out there. We update it daily with all the latest & best in recalls & other pet-related news; behavior/training tips; & entertainment. Join us there to laugh & learn. Stop by & share how you & your pets are spending your summer. We’d love to see your ideas, pictures & videos. Keep cool! Are you hitting the road with Pup? Make it fun & safe: Dogs should definitely ride inside! When it comes to traveling with Fido, everyone has their personal preferences regarding seating arrangements & gear. Whatever setup you choose, it should fit a simple criteria: Pup should be secure in the back seat, so she can relax & not be a distraction to the driver. We’ve heard horror stories about pets riding freely in front seats or on laps. One that comes to mind happened to a client of ours who was driving with her little dog loose in the front passenger seat. She had to hit the brakes to avoid rear-ending a car that stopped suddenly in front of her. The abrupt stop propelled her dog under the brake pedal. As a result, she did hit the car in front of her. Thankfully, she & her dog are fine. But a valuable lesson was learned. Car seat & harness (for little dogs) – Make sure it’s the right height for your dog and that it can be belted into the back seat. Of course, it should also include an attachment for your dog’s harness. By the way, many of the items in our list are harness-based. So get Pup a comfy, padded harness, and help her acclimate to it on walks or supervised @ home. That way she can relax while wearing it in the car. For small dogs, we like soft neoprene harnesses, like Puppia or Cloud. (The Cloud harness is shown in the video, below.) Our Rusty showed off his car seat, which admittedly was a worthwhile splurge. We chose it for its height, soft sides (chin rests), and the cover’s wash-ability. Harness & tether (for larger dogs) – As mentioned above, get a padded one and acclimate Pup to it ahead of time. We like the Bergan seatbelt harness (tether included). If Pup already has a comfy harness, tether her to a seatbelt with the Ultimate Seat Leash. It fastens to any seat belt & adjusts from 16″ to 24″. Front seat barriers – To keep Pup in the back seat if she’s not tethered. The Screen Barrier covers more space between front seats & is “claw-proof”. The Kurgo barrier also allows Pup to see through it. These options are pricier, but they’re well-made. If Pup relaxes best when she can see through the barrier, then these are for you. If Pup doesn’t mind a barrier that blocks her vision, consider the more affordable Kyjen Outward Hound barrier. Backseat slings or hammocks – Want a safe alternative to tethering? These seat covers prevent Pup from falling onto the floor behind the front seat. They also double as a front seat barrier. Here’s a nice example. Know that there are many types in all price ranges available. Bonus: Slings protect your car from fur & muddy paws! Seat extenders – These only prevent Pup from falling onto the floor behind the front seat. They do enlarge the backseat to accommodate a larger dog. You’ll need another system to restrict Pup’s movement, though. Here’s an inflatable version. Overhead backseat cables – This system also requires a harness/tether setup, but Pup can roam the back seat. Just make sure Pup can easily sit & lie down when she’s tethered. The Kurgo Automobile Zip-Line includes a tether & a harness. Cargo barriers – These grates essentially turn the back of your SUV or van into a crate, so that the backseat is available for humans. OK – Back to the gear. What if Pup likes to feel the wind in her fur? We strongly discourage folks from allowing their dogs to ride with their heads outside car windows. Yes, it’s cute. That is until Pup gets something in her eye or escapes from the car – just to name a few of the things that can go wrong. Window screens let the breeze in while keeping Pup safely inside. On the high end (design, durability & cost) is the BreezeGuard. On the low end (cheaper & less durable) is the window vent. If you must allow Pup to hang out the window, protect her eyes…. we love Doggles! Still need to see dogs free in cars? Watch this video. It’s 5-minutes of cuteness: Dogs riding in cars, heads hanging out windows, in slo-mo. These dogs are doing it, so your pooch doesn’t have to! “It’s a spring thing!” – Includes links to our fave pet travel blogs to help you plan trips with Fido. “Summer’s here!” – One of our best lists of tips & ideas for family activities that include pets. “Have a great holiday weekend!” – Important summer tips, including links to our recommended local resources (day cares, pet walkers, pet sitters) & a nice video on camping with pets. We update it daily with all the latest & best in recalls & other pet-related news; behavior/training tips; & entertainment. Join us there to laugh & learn. Stop by & share how you & your pets are traveling in style & enjoying the sun. We’d love to see your ideas, pictures & videos. Happy trails! This post is purely for fun because it’s our favorite season. We think the happy little dogs in our video collection capture the joy of spring perfectly. How much happiness can a squeaky toy create? Ask Andy! This canine classic puts a smile on our faces every time. Happy spring! Catnip’s wonderful effects are often undervalued and overlooked. Our clients are frequently surprised when we recommend catnip as part of a plan to resolve their feline behavior problems. If used appropriately, catnip can help Kitty deal with emotional states that are at the root of unwanted behaviors. Perhaps you & your cat can benefit from the effects of catnip, too. Is your cat crazy for catnip? Find out how to make the most of it in our article. 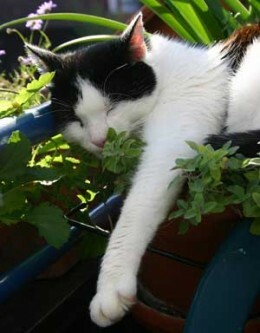 If you’ve got spring fever & a green thumb, start some catnip in your garden. Your cats will love you for it! We’re still laughing @ this highly anthropomorphized video. Enjoy! How about a touch of the Irish for Kitty? We love this DIY clover catnip toy. Suggestions: Make more than one; follow the instructions in our article for keeping catnip toys fresh; and …. block the space under your fridge! Verse yourself in canine-speak. Review our post, “Are You a Close Talker?“. It’s packed with video illustrations of polite interactions between canines. In the post, we translate lessons learned from these dog-dog interactions into guidelines for how humans should approach (or not approach) dogs. When you’re done, we’ll meet you back here with a current-event illustration of human-dog communication gone very wrong….. Finally, here’s the follow-up interview with Kyle Dyer. We commend her honest self-assessment & bravery in discussing her role in the bite. She didn’t have the benefit of hind-sight & slo-mo video, so she didn’t know she was threatening Max. We wish her a speedy & full recovery. We hope, through Ms. Dyer’s experience, this blog, our Facebook page, and our work with clients, to further educate folks on dog body language, proper human-dog interactions, & scenarios to avoid. Help us spread the word! Psssst…. Can you feel it? Spring’s just around the corner! Spring brings puppies & kittens! If you’re considering adopting a pet of any age, ask us for help, proactively. We’ll guide you in choosing the right pet for you & your family. If you just adopted a pet (of any age), we’ll help the transition go smoothly for all, including resident pets. Watch the lovely video, “To everyone who loves dogs“, from our post on the spirit of adoption. Start training now to enjoy the rest of your year with a happy, well-mannered furry family member! Our past spring posts are packed with sweet videos & helpful seasonal safety tips. We’ve covered gardening with pets, Easter safety tips, spring cleaning, avoiding tick bites, flea prevention, skunk season, & swimming dogs. Whew! ‘Tis the season for road trips! Visit three of our fave pet-travel blogs: Dog Jaunt is for folks traveling with small dogs. DogTrekker finds the “best places in Northern California for you and your pup to stay, eat, hike, swim and play”. Go Pet Friendly personalizes your trip according to your destination, number of people, and number/type/size of pets. Use their road trip planner to locate pet-friendly hotels, restaurants, camping & activities along your route. Brilliant! Speaking of road trips, we took an epic one up the northern CA coast for some R&R with our pal, Rusty. (He blogged about it.) Enjoy this adorable, spring-like scene that we encountered along the way. Warning: Our spring fever is contagious! We update it daily with all the latest & best in pet-related news & entertainment. Join us there to laugh & learn. Stop by & share how you’re welcoming spring with your pets. We’d love to see your ideas, pictures & videos. Let’s celebrate together!